On several occasions, I’ve observed that the poverty rate in America was steadily falling, but that progress came to a halt in the mid-1960s when the government declared a War on Poverty. And I almost always included a chart showing the annual poverty rate over several decades. Moreover, I posted graphs showing how government programs trap people in dependency because of very high implicit marginal tax rates. And that’s true in other nations as well. But it didn’t matter how many times I revisited this issue, I was never clever enough to look at the poverty-rate data to estimate what would have happened if the federal government hadn’t become involved. Fortunately, John Goodman of the National Center for Policy Analysis was insightful enough to fill the breach. He shows that the War on Poverty has made a big difference. But in the wrong way. Here’s some of what John wrote about the topic in a column for Forbes. From the end of World War II until 1964 the poverty rate in this country was cut in half. Further, 94% of the change in the poverty rate over this period can be explained by changes in per capita income alone. Economic growth is clearly the most effective antipoverty weapon ever devised by man. The dotted line shows what would have happened had this trend continued. Economic growth would have reduced the number in poverty to a mere 1.4% of the population today—a number so low that private charity could probably have taken care of any unmet needs. …we didn’t continue the trend. In 1965 we launched a War on Poverty. And as the graph shows, in the years that followed the portion of Americans living in poverty barely budged. John augments this analysis by looking at some of the social science research about poverty and government dependency. The numbers are very depressing. President Obama and other folks on the left don’t seem overly interested in this data. Instead, they beat the drums about class warfare and income inequality. They want us to believe the economy is a fixed pie and that all of us somehow get less if some entrepreneur becomes rich. But John’s point from the column is correct. Economic growth is the way to help the poor, not redistribution. Unfortunately, many politicians are hostile to the types of policies that produce more growth. Maybe it’s because they don’t understand economics. Or maybe they understand economics but don’t care because they think they’ll be more successful at the ballot box if they pursue the politics of envy and division. 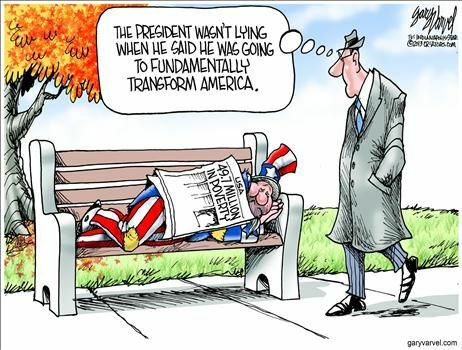 But regardless of motive, bigger government doesn’t have good results, as illustrated by this Gary Varvel cartoon. 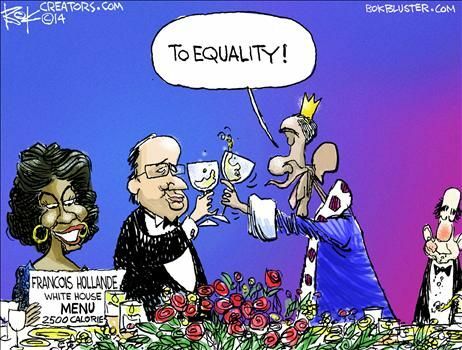 This Chip Bok cartoon, featuring Obama with his ideological soulmate, also is worth sharing. P.S. Margaret Thatcher has the best-ever takedown of the left’s inequality agenda. P.P.S. If you want to get agitated, click here to see how a bureaucracy in Paris is using American tax dollars to push a crazy new definition of poverty. Why? To promote more redistribution. That was a good one, Zorba. (*) Your choice will not be communicated to your neighbor. The Left likes to talk about ending the “war on drugs,” and may well have a valid point. I just wish they’d also be open to ending the “war on poverty,” which has done nothing but trap people in poverty. Have a look at the original post for a chart that shows what might have happened with poverty in America, if government hadn’t become involved.